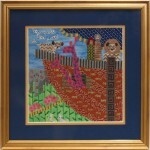 You can count on Allan Jeffries Framing for exquisite needlepoint framing. Needlepoint art can add a homey touch to any space. Whether you’ve just stitched a tongue-in-cheek contemporary needlepoint motto or you have discovered a vintage piece in your grandmother’s attic, your piece of textile art definitely deserves professional needlepoint framing. At Allan Jeffries Framing, we have literally thousands of options for needlepoint framing. We have over 3,000 wood and metal frame moulding samples in our shop for you to browse when choosing your custom frame. We also have plenty of readymade frames in case your needlepoint will fit in a standard size frame. With all these options, you are sure to be able to find the exact size, style, and color of frame you envision for your needlepoint. If you are concerned about preservation of the needlepoint, we will be sure to incorporate archival-quality materials into your needlepoint framing. Needlepoint framing is really not a DIY project. It is nowhere near as simple as slipping a photo into a readymade frame you picked up at your local hobby store. Instead, the fabric must be carefully stretched and held in place inside the frame to prevent it from sagging over time. To do this, you can either mount the needlepoint on a stretcher frame, or else stretch it over a foam board and then stitch it in place. If you use a foam board, the fabric may need to be cut at the corners so it can fold around the board without bunching. If you have a vintage needlepoint, you may be very reluctant to cut it. Fortunately, there is another option: a floating mount. This type of mount deliberately leaves the edges of the fabric uncovered and is an excellent way to display a needlepoint with a crocheted lace or tasseled edge. No matter what option you choose for your needlepoint framing project, you can rest assured the talented frame artists at Allan Jeffries Framing will get the job done perfectly. If you have questions about needlepoint framing or would like to browse our frame samples, please stop by one of our three frame shops today.